Doug Engelbart, who has died aged 88, never really made any money from inventing the mouse. Here are 10 others who didn't get to be billionaires. When Nick Holonyak Jr invented the first practically useful LED in 1962 he predicted it would one day replace Edison's lightbulb. Holonyak's colleagues have said he should be given the Nobel Prize but he humbly says: "It's ridiculous to think that somebody owes you something. We're lucky to be alive, when it comes down to it." 3M sell billions of Post-It Notes each year but its inventors describe themselves as "comfortably off" not wealthy. They were the co-creation of Dr Spencer Silver, who in 1968 developed an adhesive that had a "removability characteristic", and his colleague Art Fry hit on the idea of a bookmark that would stay in place in his hymnbook. The Kalashnikov rifle, or AK-47, was invented by Soviet Army soldier Mikhail Kalashnikov while recovering in hospital from injuries sustained in World War II. 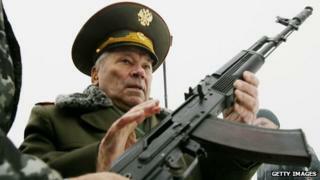 Kalashnikov claimed his creation was for the benefit of his country. Marie Killick invented a sapphire stylus for a record player but could not license it and despite years of litigation never made any money. In 1958 she won a lawsuit against Pye but went bankrupt the following year. Sir Christopher Cockerell used a vacuum cleaner and tin cans to test his theories as he developed the hovercraft, which first crossed between Calais and Dover in 1959. Cockerell was knighted but fought for years to get a lump sum from the National Research Development Corporation. Russian computer programmer Alexey Pajitnov's game Tetris was developed alongside colleagues at a Russian government-funded research centre in 1985. He only started getting royalties 10 years later when he formed The Tetris Company. Inventor Trevor Baylis recently said he can no longer afford to live in his home in Twickenham, London, because despite millions of sales around the globe, the company he went into business with were able to tweak his design and he lost control over the product and profits. "Most of us don't do it for the money but for the buzz," says Baylis. "I know that at least I've left my mark with the radio, the wind-up torch and other things I've invented." Japanese businessman Daisuke Inoue made money from playing drums in a backing band which let bar goers take the mic and have a go at singing. One time when he couldn't make a gig he put the backing music on tape instead and later made 11 Karaoke (empty orchestra) machines which he leased out. He didn't patent his invention and barely made a yen. The MP3 quickly became the standard for transferring music over the internet. German PhD student Karlheinz Brandenburg started work on the project in the 1980s but because there was no money to distribute the software it was marketed as shareware. And finally, no-one would have stumbled across this list save for Sir Tim Berners-Lee, who created the web to help scientists working at the European research lab at Cern. He says the secret of the rapid success of his invention was the fact he made it freely available. Not all inventors are driven to make money but some want to make a contribution to the "common good", says Dr Tilly Blyth, Keeper of Engineering and Technology at the Science Museum. "We tend to focus on the commercial development but in fact its often public and government research that has got it to that stage," Dr Blyth says. "If you look at the iPhone you think it's a great invention from Steve Jobs and Apple but look at the vital components like the screen, the chip and the processor and their origins were all in government-funded research." "A lot of the real cutting-edge research comes from the pure and blue sky thinking done in public research facilities for the good of humanity rather than to make money."